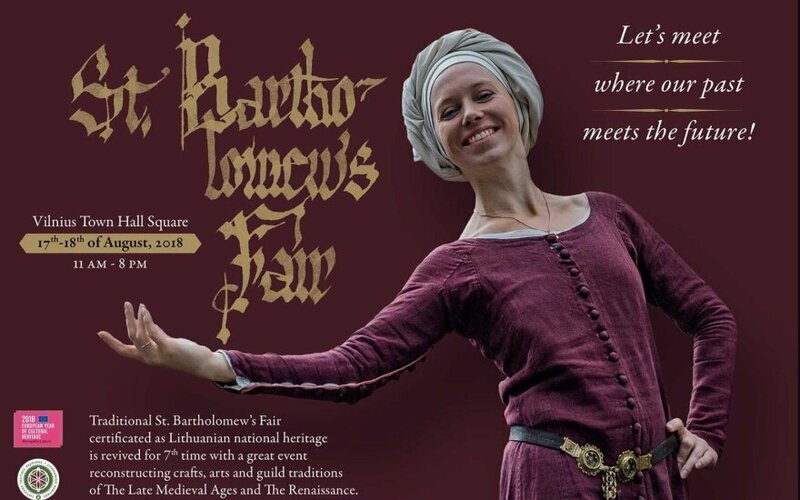 Traditional St. Bartholomew’s Fair certificated as Lithuanian national heritage is revived for the 7th time with a great event reconstructing crafts, arts and guild traditions of the Late Medieval Ages and the Renaissance. The Fair will be held at Vilnius Town Hall square on the 17th–18th of August, 2018. Though the Fair has been known for the citizens of Vilnius since 17th century after being mentioned for the first time in 1664 on the first Statute of potter’s guild, originally it is dated back to the 24th of August, 1495. On the eve of this date Grand Duke of Lithuania Alexander Jagiellon approved the statute of the first guild of Grand Duchy of Lithuania and the privilege to Vilnius goldsmiths’ guild was granted by the Duke. In 2009 PE Amatų gildija (The Guild of Crafts) revived this unique tradition of Vilnius city – to commemorate the St. Bartholomew’s day by organizing the festive craft fair. 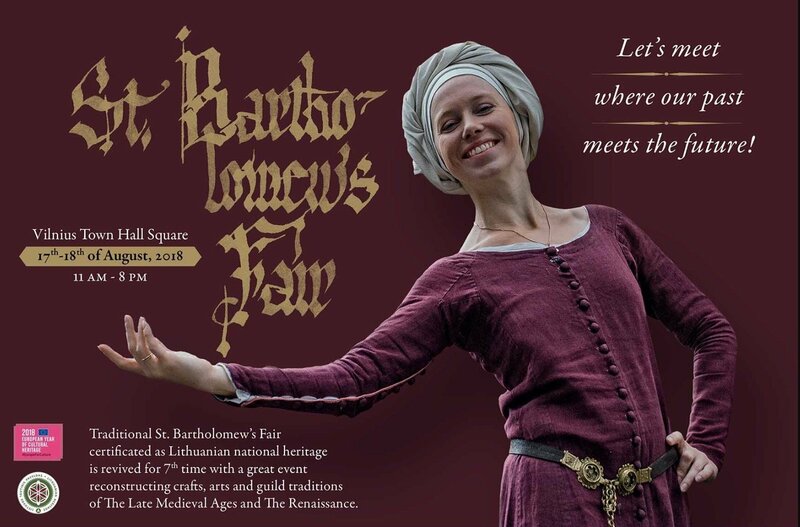 After the break of three years, the St. Bartholomew’s Fair is revived for the 7th time on the 17th–18th of August 2018, and guests and citizens of Vilnius are welcome to visit this Fair at Vilnius Town Hall square. St. Bartholomew’s Fair lasts for 2 days. It opens with a solemn parade with the flags of the Vilnius craftsmen guilds (The Gates of Dawn, Vokiečių str., Dominikonų str., Šv. Jono str., Pilies str., Didžioji str., Town Hall Square). During this event citizens and guests of Vilnius get the exceptional chance to get acquainted with crafts, see the warfare and noblemen’s fights of 17th century, see demonstration of production processes, be in craftsmen’ shoes by throwing, spinning, weaving, forging coins, admire costumes and watch puppet theater, dance and listen to the music of the Late Middle Ages and the Renaissance, listen to the lectures about history of crafts and St. Bartholomew’s Fair in Lithuania and Europe, and purchase items reconstructed by professional craftsmen according to the originals of 15th–17th century. Organizers of this Fair invite all citizens and guests of Vilnius city to commemorate this unique festival of city’s craftsmen not only in the context of historic guilds of Lithuanian cities, but also the 100th Anniversary of Restoration of Lithuania’s Independence, the 695th birthday of Vilnius city and the European Year of Cultural Heritage. Historic St. Bartholomew’s Fair is certificated as Lithuanian national heritage and maintains traditions of crafts and city’s culture. This revived festival is valuable as the part of Intangible Cultural Heritage for strengthening the cultural contents and significance of Vilnius Historic Center – UNESCO World Heritage Site.